Curled Parsley | Healthy, Tasty and Definitely a Super Herb! Curled Parsley - Healthy, Very Tasty and Most Certainly a Super Herb! Flat leaved and curled parsley can be considered a super-herb! These delicately flavoured leaves can act as an accent to so many different dishes, and they are packed with vitamin C, vitamin A, B vitamins and iron. It is also rich in anti-oxidants and folic acid. And research has shown that it has anti-inflammatory properties and can help boost your immune system. Over the centuries, it has been used to treat many gastrointestinal disorders, including indigestion and constipation. It has also been used to treat high blood pressure, urinary tract infections and kidney stones. Read more about the health uses. Today, it is commonly used as a highly-effective breath freshener and parsley oil is a common ingredient in soaps and cosmetics. A word of caution for pregnant women: while parsley is perfectly fine in normal culinary amounts, you should be aware that in very large quantities it can be considered risky as it can encourage menstrual flow and uterine contractions. Note: You can use fresh and dried parsley to make a healthy drink. Click for my parsley tea recipe. Fresh parsley will keep for about two weeks in your refrigerator. Make sure to sprinkle some water on the leaves and store inside a plastic bag to make sure it lasts as long as possible. You can also freeze your fresh parsley, which will keep for about six months. Or, my favourite way, chop the leaves and mix with a little water and freeze right into an ice cube tray. Each slot equals about one tablespoon. This way you can just pop them out straight into your cooking. Dried parsley will last up to a year, but keep it inside an airtight container in order for it to retain its full flavour. 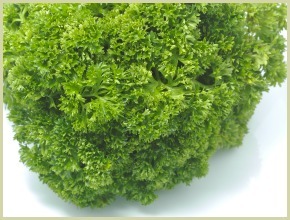 Read more about curly leaf parsley.